UnitedHealth Group reported first quarter earnings from operations growth of 18.8 percent year-over-year, driven by a strong performance in the Medicare Advantage and Medicaid markets as well as double-digit percent increases in its Optum segments. UnitedHealth Group reported $4.1 billion in Q1 earnings from compared to $3.4 billion for the three months ended March 31, 2017. First quarter net earnings grew by 28.7 percent over the previous year. Based on first quarter results and the business outlook for the balance of the year, UnitedHealth Group has increased its outlook for 2018 net earnings. UnitedHealth Group looks very different from five years ago, said CEO David S. Wichmann during Tuesday's earnings call. Today clinical and technical professions are the first and third largest job categories across UnitedHealth Group. Five years from now the company will also be different. "Within 10 years, we expect half of all Americans will be receiving their healthcare from physicians operating in highly evolved and coordinated value-based care designs," Wichmann said. UnitedHealthcare, the company's insurance arm, reported earnings from operations for the quarter of $2.4 billion, compared to $2.1 billion the year before, a 12.5 percent increase. The insurer serves 2.2 million more consumers quarter-over- quarter, but as forecasted, the employer and individual market served 195,000 fewer people in commercial group plans. This was due to employers shifting their retirees from self-funded offerings to group Medicare Advantage plans and lower retention due to pricing to cover the full cost of the health insurance tax. The Medicare Advantage and Medicaid markets are growing. UnitedHealthcare grew to serve 375,000 more seniors with medical benefits during the first 90 days of this year, including 330,000 more in Medicare Advantage, according to Steve Nelson, CEO of UnitedHealthcare. Medicare Advantage enrollment grew 10.6 percent year-over-year. 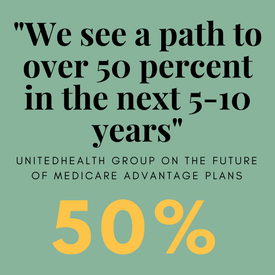 The Medicare Advantage market has always been competitive, said Brian Thompson, CEO for UnitedHealthcare Medicare & Retirement, to a question on other insurers jumping into the space. But the Medicare Advantage market is also under-penetrated, he said. It has 33 percent of senior citizens in plans today, but the company sees a path to over 50 percent in the next 5-10 years, he said. "In Medicaid we continue to expect strong revenue growth in 2018, and that includes ongoing national growth serving dual special needs members, providing them aligned benefits and comprehensive service to address their often times more complex care needs," Nelson said. The insurer closed gaps in care through simple preventative measures such as flu vaccines, to serving more complex needs. The social determinants of health such as lack of affordable housing, food insecurity and isolation weigh heavily on gaps in care. Social investments are the next frontier to serving the whole person, executives said.